Special Containment Procedures: SCP-1119 is to be contained in an M-Type Humanoid Anomaly Containment Cell (HACC) at Site-53. In the event personnel need to enter SCP-1119's cell, they are to wear Level C Hazmat suits to avoid skin-to-skin contact. All requests made by SCP-1119 are to be screened and allowed or denied as per standard Euclid-class humanoid containment protocol. Barring express permission by at least one member of attached Level 3 Research Staff, SCP-1119 is not allowed to leave its cell. Description: SCP-1119 is a Caucasian male aged 54, measuring 174.3 centimeters and weighing 154.6 kilograms. X-ray scans and exploratory surgery of SCP-1119's body have yielded several anomalous findings. Evidence exists of absorption of tissue and organs belonging to other sentient beings by SCP-1119's body. This resembles twin embolisation syndrome, although this has never been shown to occur outside of the uterus. SCP-1119 has been found to have two human eyeballs attached to the interior of the medial lobe of the right lung. In addition, SCP-1119 carries several superfluous organs and miscellaneous tissues, including a kidney, two spleens, a gall bladder, two fallopian tubes and approximately 3.4 meters of small intestine, all of which are stored in the abdominal cavity. 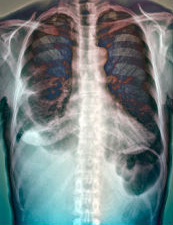 These organs and tissues are connected to SCP-1119's body by a network of small blood vessels so that atrophy or necrosis of absorbed material is prevented. DNA tests on samples taken have shown tissues present belonging to at least fifteen separate individuals, both male and female. None of these could be reliably traced, though one was shown to be similar enough to SCP-1119's own DNA to assume a direct genetic relation. Tests have shown that skin-to-skin contact with SCP-1119 will initiate the absorption process. Once contact has been made, cells in the epidermis of SCP-1119 bond with those in the victim's skin and absorb them. The process appears to be irreversible and can only be halted by amputation or excision of connected tissues. SCP-1119 shows signs of severe stress when absorption occurs, while victims appear to enter a coma-like state within 2-5 seconds of initiation of absorption. It is currently unknown what causes this state. Total absorption takes approximately ten minutes per kilogram of tissue. The process seems to move around any non-organic matter it finds, leaving any such article behind after it completes. Note that although absorption of victims is complete, SCP-1119's body mass does not increase correspondingly. It is currently unknown how SCP-1119's body processes absorbed tissues. SCP-1119 does not appear to retain any characteristics, memories or personality traits of those absorbed. SCP-1119 has exhibited relief at being held for research by the Foundation, but does suffer from severe clinical depression. Treatment has been started using counselling and medication (50 mg Fluvoxamine: oral dose 1x per 24h). SCP-1119 is extremely uncomfortable around others and will not usually initiate any form of contact. Genealogical research has revealed SCP-1119's father to have been deceased since ██/██/19██ and his mother to have been deceased since ██/██/20██. SCP-1119 has referred, when pressed, to his life as extremely sheltered. SCP-1119 came to the Foundation's attention when it attempted to commit suicide by jumping from the ███████ Bridge. Despite clear warnings by SCP-1119, a police officer grabbed his hand and was partially absorbed in full view of the public. The resulting 911 calls were intercepted and a containment team was sent out. Emergency airborne Class-A amnestics were administered to all involved and SCP-1119 was taken to Site-53 for evaluation. Broadcasts of footage taken at the site were disrupted and all evidence was confiscated and destroyed as per guideline Hm/Gd-Evt-0013-E:rev2.16. SCP-1119 has shown limited regenerative qualities following incident 1119-I-01. Further research warranted.